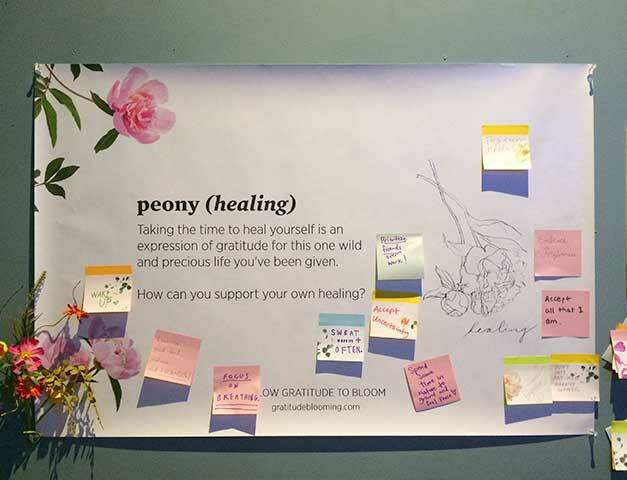 Our Gratitude Blooming gardens are places where people can pause and share written reflections to a provocative question inspired by art and nature. As founding ‘farmers’, we have seen our gardens spark feelings of joy, vulnerability, and truth. We have seen them cultivate meaningful connection and dialogue that would not have happened otherwise. 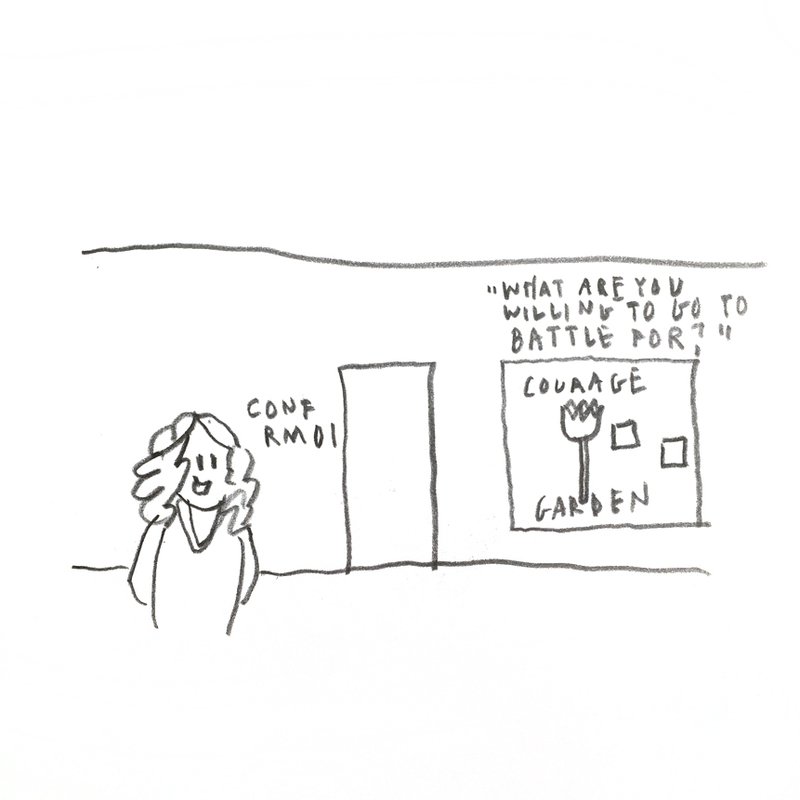 Our 1st courage garden (protea with nasturtiums): What in your heart are you willing to go to battle for? The artwork and wisdom people leave behind bring beauty, peace and inspiration to physical spaces. 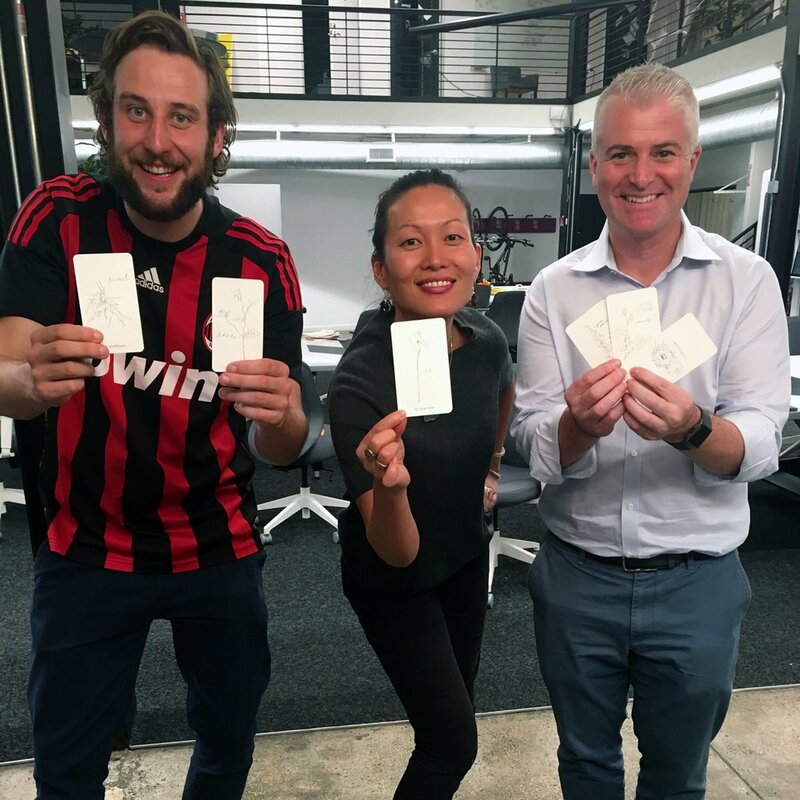 Research shows that the regular practice of gratitude can bring more joy, wellbeing, and connection to our lives, our workplaces, and our communities. People who keep a gratitude journal sleep on average 30 minutes more per night, wake up feeling more refreshed, and have an easier time staying awake during the day. Practicing gratitude generates higher levels of emotions such as joy, enthusiasm, and optimism, and lower levels of destructive impulses such as envy, resentment, greed, and bitterness. People who practice gratitude feel closer to friends and partners, and are generally more compassionate and altruistic. Curious to know what scientists have to say about the benefits of gratitude? Check out this research summary published by the Greater Good Science Center at UC Berkeley. 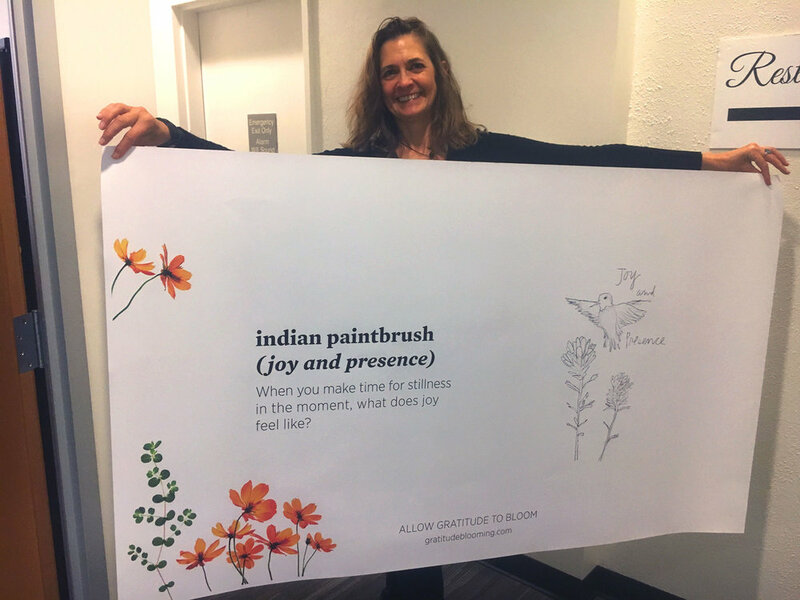 Grow mindfulness and belonging in your organization with our gratitude garden kits! 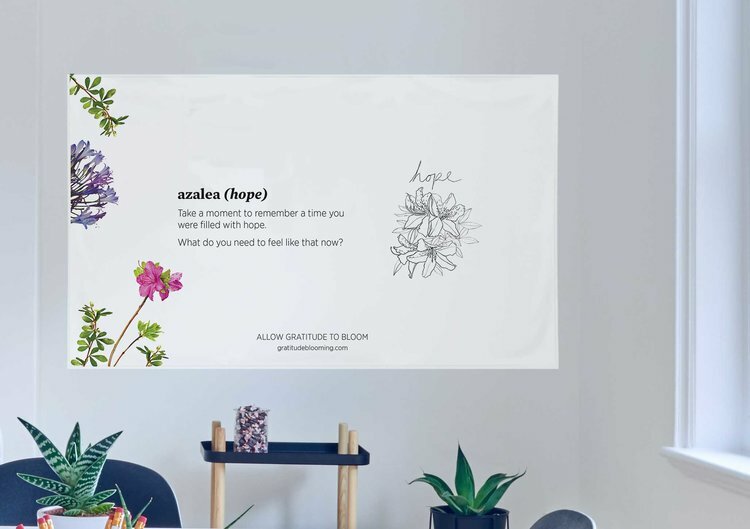 Our gratitude garden kits are designed to create inviting spaces for people to contribute their seeds of gratitude and wisdom with the messages they leave behind. Our goal is to eliminate stress, anxiety, and loneliness in every place that a gratitude garden is planted. Order your Gratitude Garden kit for the theme of your choice. 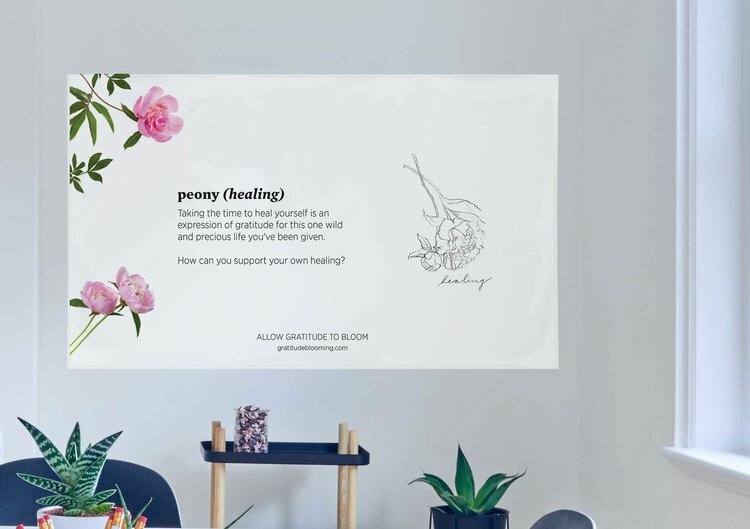 Place the posters in high-traffic spaces that are inviting and accessible for people to take a pause to enjoy the artwork and plant their message. Get creative with decorating your garden! Remember, no two gardens are the same. At a regular staff or team meeting, dedicate time for people to take a look at the messages in the garden and share what insights are emerging. You can also use your gratitude card deck as an ice breaker or team ritual by having each person pull a card at random or choose a card that expresses a feeling or response to a question. Invite people to connect when the random moment strikes too! You get an assortment of postcards with each kit. 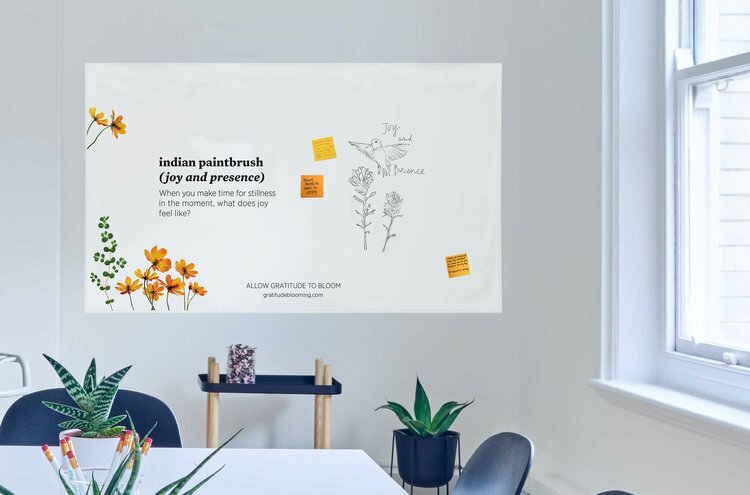 Give each person a postcard to place in their personal space for inspiration. You can also choose to give your card to someone or plant your message in a secret spot for others to discover. Set of 4 unique post-it note designs (50 sheets per pad). Limited offer while supplies last! 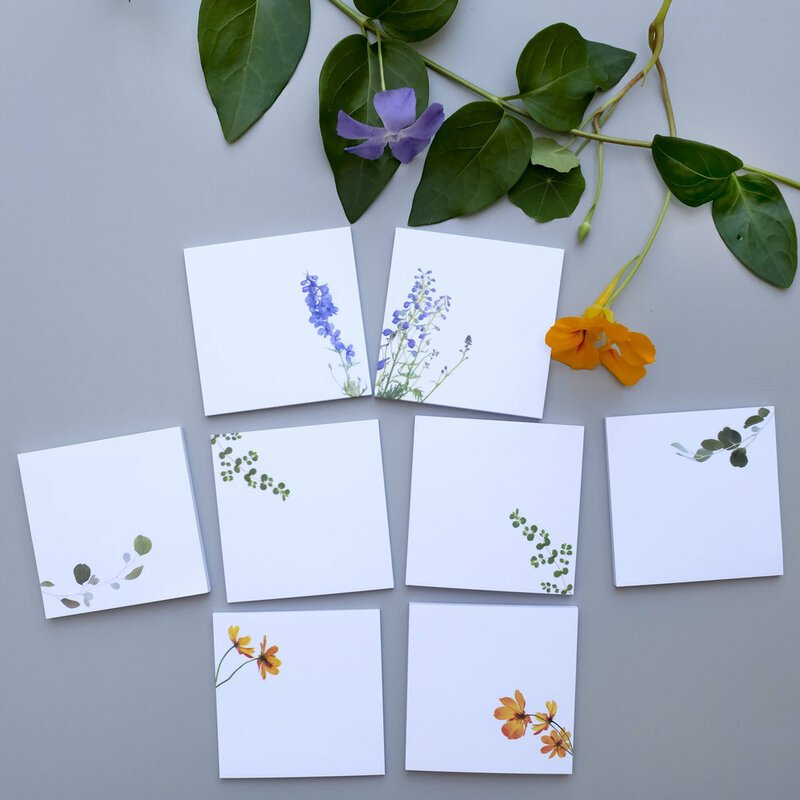 These post-it notes are designed to be used with the Gratitude Blooming Gardens. Hot off the press, these are the 3rd edition of our Gratitude Blooming card deck (39 unique drawings and reflection prompts for each one). Perfect to help start a personal gratitude practice. about our gratitude practices and tools? "This journey has allowed other colleagues to open up." "I'm transforming my discomfort into discovery." 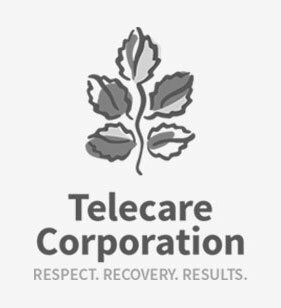 "I hope to continue this with my employees, family, and friends." "Today, I shared @GratitudeBlooming cards with 80 program leaders. Amazing energy shift in the room as people reflected on unique cards they randomly selected. We talked about the challenge (and release) that comes from seeking gratitude around “beautiful sadness,” “impermanence,” “tenacity,” and “remembrance”. And the gentle joy that is rediscovered when considering “simplicity,” “wholeness,” and “grace”. Folks then responded individually to prompts on large posters, placing their reflections up in silence. 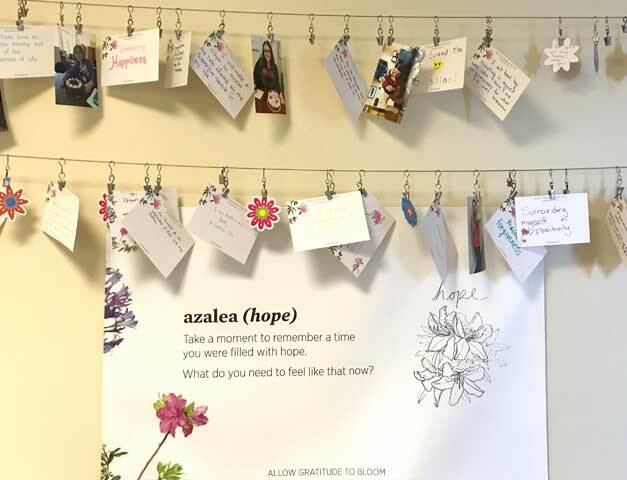 As those assembled quietly read the statements on these “Gratitude Gardens,” an unanticipated feeling of connectedness emerged and it felt like anything was possible. The capacity and potential of those assembled was palpable — I was in awe." 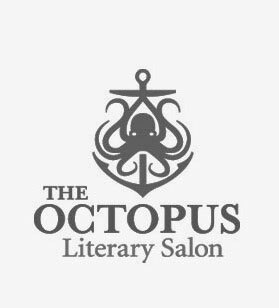 " I attended the Gratitude event at Octopus tonight (I had the Courage card). I wanted to commend you for coming up with the concept of the cards and for organizing the event. It generated some really interesting and profound conversations with people who previously were strangers. Thank you." 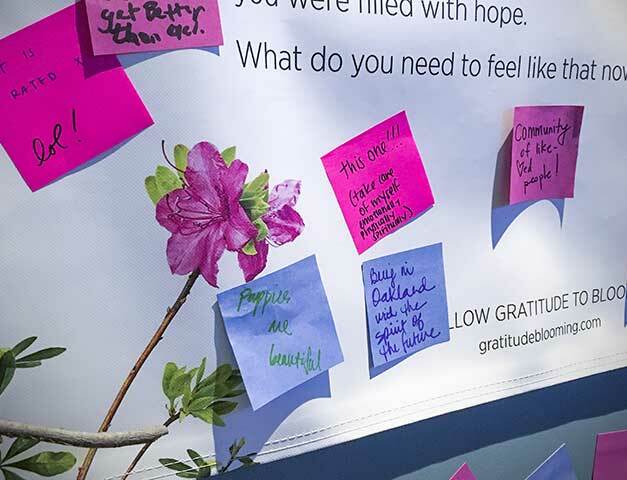 "Wow, the gratitude garden was my favorite thing in the Wisdom 2.0 village. I loved it!" Which themes will bloom for you? Have a custom theme, group size or space in mind?